Another swap on Quilting Board, and the theme was "Show us where you're from." Peggy made this lovely Southern Belle gazing out over the landscape. The lines of quilting over the fields converge at a point on the left of the picture, giving the impression that that is where the belle is looking. Peggy very skilfully worked with the tiny pieces that make up the belle's figure and added decorative stitching to the dress. The whole effect is very whimsical. Peggy said that it reminded her of Scarlett O'Hara in Gone With The Wind. Thank you Peggy for the lovely doll quilt! Free motion work is a bit of a leap into the unknown. Not only do you have to get used to the fact that the machine can work in any direction, also, if you use only vintage machines, you have to shake off the notion that only modern fancy machines can do it. It is about three years ago that I started looking on the internet at what was possible with vintage machines. Imagine my delight on realising that I had the right model of treadle sitting in the house all along - it just needed a good clean up. Then I discovered the wonderful Leah Day, the undisputed Queen of Free Motion Quilting. There are too many patterns on her blog for me to try out in the years I have left to me. Leah was wise - she started young. how to move your hands and manage the movement of the work through the machine. Leah took care of the hands, but treadling is equally about the feet. This is the lady to watch, doing free motion embroidery for handbags. Her feet do not stop, she just keeps on going at an even speed. She's so good at it she can take her eyes off her work and look up and smile at people. Leah Day and the anonymous Laga Lady clinched it. Between them they launched me into free motion quilting on the treadle. If you want to try free motion quilting on a vintage machine you need a Singer 15. There were many minor variations over the years, for example, different stitch length levers, and on some the feed dogs drop. My treadle is a basic Singer 15K (K just means it was manufactured in Scotland, in the factory at Kilbowie). Singer 15s are easily recognisable by the tension discs, which are on the faceplate at the back. The bobbin is held in the bobbin case directly below the needleplate. This is the central bobbin mechanism, and it is this method of stitch formation which allows the movement of the work necessary for free motion quilting. Many other manufacturers made machines based on Singer 15s, in particular in Japan after the Second World War. These machines are equally suitable for free motion work. For a good look at this type of machine, you may want to watch the video with the threading instructions. So if you have a treadle or electric Singer 15, or another manufacturer's copy, and want to have a go at free motion quilting, give it a try! This was the only spare bobbin I had the other day when I needed to fill up with thread. Old machines often come with bobbins that have been holding thread for years. The thread absorbs moisture and the rust is revealed when the thread comes off. It was time to get busy with the metal polish, which is best applied with strong cotton string or crochet cotton. Loop one end of the string around the back of your chair or anything else that happens to be handy, twist the string into a single strand and put on a splodge of metal polish. Next, twist the cotton once round the bobbin. If you are cleaning a long bobbin, use the same method, but it is harder to keep a good grip on it. It will go flying across the room at least once. Then hold the string taut, hold on tight to the bobbin and run it up and down so that the metal polish is rubbed on with the string. It's a vigorous job. All the rust will rub off, the string will turn black and fray and you will end up with a very hot thumb and forefinger from the heat generated by the friction. Here is the same bobbin, still discoloured and blemished, but free of rust and with a distinct shine to it. I found that the manufacturer's badge was lurking under the rust, with the clearly discernible word "Japan" . I used Peek Metal Polish which I buy from the hardware shop down the road and which can be bought online direct from the manufacturers through their website. It is the only metal polish I use on sewing machines, and my brother in law has been converted to it after I gave him a tube of it so he could clean up a copper kettle. Yes, it's free motion quilting time. It's a bit like jumping into cold water - you have to brace yourself. Then after a few days' practice you just stroll over to the sewing machine and casually blaze away for ten minutes and another section is completed. Making the video was fun. I will just let you imagine my feet. My slippers kept slipping off so they were held in place with strips cut off an old pair of tights. Also the lighting is tricky on wet November days and I managed to drop a lamp and smash it. All in a day's work. This was last month, before the amount of water we had reached unmanageable proportions. Each drop has an inverted image of the trees behind it - best seen if you turn your head upside down. Robin made the perfect doll quilt for me. I love the central panel, the little girl looks so busy and contented. The sewing machines in the border fabric are intriguing. This little red one is definitely American, with the tension discs on top. This looks like a Singer 127. And another American machine, with the peculiar shaped bobbin plate. Thank you Robin - it is an absolute treasure! The scrap jar was getting a bit full, and many of the pieces were really tiny, so it was time to do a bit of paper piecing. It was very satisfying to make a little quilt out of such unpromising little scraps. Also I decided to have a go at free motion quilting with the Singer 15K treadle. It was fairly smooth work around the border, but going over the seams of the pieces in the centre was a bit of a bumpy ride. Now I know why it is important to iron seams flat if you are going to do free motion quilting. Last month I took a trip to see some friends in South Wales. I was doing the stitching around the last piece of appliqué on the Diamond Jubilee Quilt at the time. 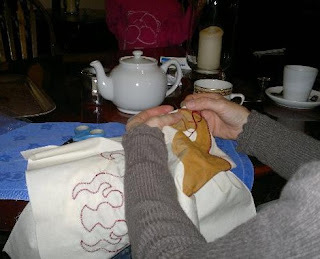 We ended up in a lovely quiet pub where I could relax with a pot of tea and do a bit more of the blanket stitch. This piece of material rose to surface while I was rummaging in a charity shop a few weeks ago. It was a generous size, a yard and a half by 26 inches. I have already used some of it. It came in very handy. Very Laura Ashley. Very 1970s. There was no escape from brown. Hold a coin firmly in place against a piece of felt and cut around it. A 10p coin is the perfect size. Fold the felt circle into quarters and snip off the point. Yes, I know the picture is fuzzy. Just like the felt. Time taken - less than it takes for the kettle to boil for a cup of tea. This is the foot that I use for free motion quilting on the Singer 15K treadle. The hopping foot has to be put on with the lever in position above the screw of the needle clamp. When sewing the motion of the machine will move the lever up with every stitch. The spring in the hopping foot will make the lever come back down as the needle goes back down. When the lever is down the foot will give light pressure on the work, sufficient for the stitch to form through the layers to be quilted. When the lever is up the foot is raised so that the work can be moved in any direction you want. ..or was he just a bit dazzled by the sun? Welcome to Bea - thank you for following! This stitched picture looks like an illustration from a 1920s children's story book. I found it in a charity shop about three years ago. It is a bit stained, and the blue lines of the transfer are peeping out here and there from under the stitches, but it has a certain faded charm and had to come home with me. A very warm welcome to the latest follower, Sew Scrumptious Louise - thank you for following, and a thousand thanks for organising the sewing session on Thursday! I love the pictures you have posted on your blog. This morning Maria hung up a selection of the dresses that were made at Cordial and Grace yesterday. Here is the jolly little pink and green number I made on the Jones CS. Next to it is a lovely dress with hand printed butterflies. Some were decorated with appliqué flowers or butterflies. It was a fantastic event for such a worthwhile cause. Louise of Sew Scrumptious was there, looking delighted at all the dresses being produced. She is the co-ordinator in this country for Dress a Girl Around the World. It's great to know that somewhere in the world little girls will be thrilled when they receive these dresses. Thank You, Duncan... and Lily! If you have been following the story about Maria's machine at the sewing café Cordial and Grace, you will remember that after cleaning it, the only needles I had for trying out the stitch were blunt. Duncan has been following this blog for a while now, and very kindly sent Maria a couple of needles that he had spare, and also a photocopy of a manual for the Jones CS. It was a lovely surprise. Thank you, Duncan! Anybody who needs replacement needles for a Jones machine can get them from Helen Howes. She has a fantastic website with all sorts of bits and pieces for vintage machines - I have put a link for her website on the sidebar so she is easy to find. Maria was going to get in touch with her, but running a cafe keeps her well occupied, and Duncan sent the needles before Maria had got round to contacting Helen. The café was a hive of activity today for the first anniversary celebrations. Maria hosted a special event, making dresses for the Dress a Girl charity. All her electric machines were in use throughout the day, and for a couple of hours or so I gave the Jones CS a share of the action too. I took my friend Lily with me, who is nearly 10, and she helped me make a lovely little pink and green flowered dress. For ages I was looking forward to trying out free motion quilting on the Singer 15K treadle, but first I had to clean up the machine. Then I had to find a suitable foot. I was lucky enough to find this hopping foot in a second hand shop in an attachments tin, along with one or two unremarkable oddments. It is interesting that on close up photos you see things that you wouldn't necessarily have noticed otherwise. Was it me who caused that nick on the right hand side by bashing the needle down onto the foot (all part of the learning process) or was it the previous owner? The seam guide needs to be screwed down tightly so it doesn't shift out of position while you are working. The danger is that a touch too much pressure can damage the surface of the bed of the machine. If your machine is beaten up already, then a few more scratches add a bit more character. However, if you want to prevent damage, the answer is a piece of felt. Cut a little hole for the screw to go through, and you have the perfect protection. On old machines you frequently find that the rubber tyres on the bobbin winders are cracked and brittle with age. My 1927 Singer 99K was an exception. This is the state it was in when I got it. For some reason, don't ask me how, the tyre had melted, sticking to everything in its path. Some of it was sticking to the bobbin winder. The rest of the rubber had dripped down to the bed of the machine below, settling into a horrible sticky blob, even running off to the right and gumming up the lid of the side compartment. Fortunately cleaning it off wasn't as bad as I anticipated. I pulled off most of it with my fingernails. Now the machine has a new tyre, and there has been no lasting damage to the bobbin winder. The last traces on the bed of the machine came off after I rubbed undiluted washing-up liquid over it. I am always a bit nervous of damaging the decals, so it is always best to try out on a tiny area first, but there was no harm done here. He was making the most of the sun in October. This is the card that made up my mind. My grandfather was in the Royal Engineers in the First World War, so there was no way I wasn't going to buy it. The quality of the stitching is exquisite. The lettering on the regimental badge is tiny, faded, but all still plainly legible - Royal Engineers in yellow on a blue background, George V's cypher, GVR, in the centre, and the motto Honi soit qui mal y pense around it in yellow on a white background. I have never taken the cards out of the frame to see what, if anything, is written on them. They were framed many years ago, and are mounted in wood, not card. Whether they are mementoes of a loved one who never came back, or souvenirs of a soldier who returned, I shall never know. All my transverse shuttle machines have a sliding knob on the bed of the machine for adjusting the stitch length. This photo is of the Little Vesta. The knob is unscrewed a little to allow it to slide from side to side, and is tightened back down into position once the stitch length is adjusted. When I started work on one of my machines the knob was jammed firm and would not slide until I had given it oil and persuasion over several days. Often people clean up an old machine with this type of stitch length adjustment and then find that the material will not feed through the teeth when they first try to sew. They think they have a serious problem with the machine, but then find that they had unwittingly had the stitch length set at nought. If only every problem with a sewing machine were so easy to solve! Welcome to the latest follower, Littlebear. Thank you for joining! This is my Frister and Rossmann Model D Transverse Shuttle machine. There is no stop-motion screw, the round metal disc in the middle of the balance wheel, which you will see on many other machines - Singers in particular. On this machine, the mechanism to disconnect the needle is wonderfully simple. It is just a metal tab that slots in and out of a notch. Perhaps one day I will find out why manufacturers abandoned this mechanism in favour of the stop-motion screw. I much prefer this tab, there is far less to go wrong with it. Stop motion screws can be blighters to fix. Nothing could be easier. This photograph shows the Little Vesta, and a previous post showed the same feature on the Vesta Transverse Shuttle machine. You just find the holes edged in red and put the oil in there. It saved an awful of of explanation in the manual, if you even have one. When winding a bobbin it is best to disconnect the main mechanism so the needle does not move. To do this on the Little Vesta, the metal knob on the wheel needs to be pulled out and twisted slightly so that it rests in place in the out position as shown. By doing this a connecting pin is taken out of the main cog behind the balance wheel, so it no longer turns the smaller cog above it which drives the main cam. This photo shows the hole in the main cog into which the connecting pin fits. This is the wheel of the Little Vesta. The mechanism is exposed, so you can have the delight of watching all the cogs doing their work. The small cog at the top is for the main cam, and the smaller cog on the left is for the bobbin winder. Cleaning this machine was a long and tedious job. It took hours with an interdental toothbrush to get all the oily rubbish out from between all the cog teeth. Because the handle is attached directly to the balance wheel, you get only one turn of the wheel to one turn of the handle, whereas machines with the usual handcrank mechanism give three turns of the balance wheel for each turn of the handle. This is definitely not the machine to use for curtains with a 90 inch drop. Welcome to Kathiego88 - thank you for following. Fab avatar! It's a soggy business, getting close-ups of tiny flowers covered in dew.